Sergeant Stephen Collison, Lieutenant Scott Mruczek, and Sheriff Tom Knight. 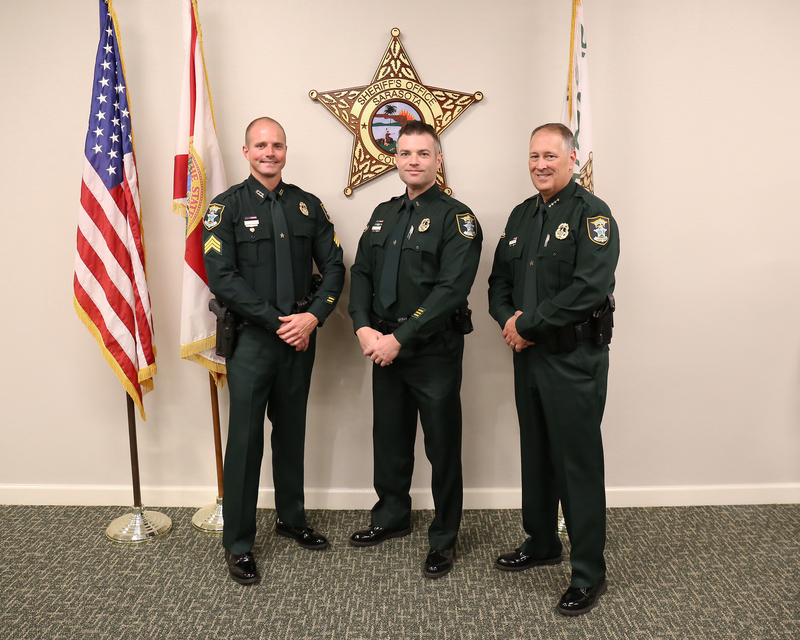 Sarasota County Sheriff Tom Knight is pleased to announce the promotion of two Sarasota County Sheriff’s Office members. Deputy Stephen Collison is promoted to the rank of Sergeant assigned to the Law Enforcement Division. Collison began his law enforcement career in 2008 when he obtained his certification and was hired by the sheriff’s office. During his career he worked in both the Patrol and Special Operations Bureaus, as well as on the SWAT Team. In September 2016, Collison was nominated for Law Enforcement Employee of the Month. He is a Field Training Officer and is trained in several areas including interview and interrogations, RADAR, narcotics and dangerous drugs, crisis intervention, and more. Collison earned his bachelor’s degree from the University of South Florida. Sergeant Scott Mruczek is promoted to the rank of Lieutenant assigned to the Law Enforcement Division. Mruczek joined the sheriff’s office in 2002 where he was assigned to the Civil Section, while he completed the law enforcement academy. He worked in both the Patrol and Special Operations Bureaus as part of the Emergency Response Team and K-9 Unit. In 2013 he was promoted to the rank of Sergeant and graduated from the agency’s Leadership Academy. Mruczek transferred from Patrol to Criminal Investigations and was awarded employee of the month in July 2017. He has taken several advanced courses through the Florida Department of Law Enforcement, and most recently graduated from FBI-LEEDA’s 241st Executive Leadership Institute, earning him the 2018 FBI-LEEDA Trilogy Award. Mruczek earned his associate’s degree from Monroe Community College and his bachelor’s degree from State University of New York at Buffalo.